Deception, betrayal, bluff and falsified commitments, that’s what The K2 has been all about. Talking about the most recent update of K2, i.e. what’s next in the upcoming episode, we have some news for you. In the recent episode, it was shown that Je Ha was able to manage the evidence embedded in the form of a memory card and was unfortunately shot. Accidentally or intentionally Je Ha dropped the evidence on a grass base, maybe hoping that it would fall into Yoo Jin’s hand. In fear of secretary Chief Secretary Kim looking for Je Ha, Yoo Jin brought him to the cloud nine. However, the safety of Je Ha remains still under question, because, Gwan Soo’s police intentionally attacks Cloud nine with an excuse to safeguard the president’s son. 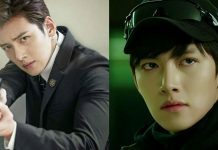 It is later shown that Gwan Soo is convinced that Yoo Jin shall no more be a threat to Je Ha’s life and persuades the police to not to pursue Je Ha anymore. Now, that everyone is confirmed inside that the memory card is stolen. Anna comes to cloud nine to see Je Ha and upon treating Yoo Jin by calling her mother, she is allowed to meet Je Ha. In the end, it also shown that Anna is forced by Yoo Jin, that she should leave Korea. In the end, Anna and Je Ha is shown sharing a loveable moment but it gets interrupted as cloud nine is still under threat. Well, there is a lot going on and the intensity of the plot is deepening. Still, only two episodes are left in the series but a lot seems to be left is to be revealed. Can’t wait to watch the last episodes.